"Eventually here will be a nice card to go with this note... I wanted to take a minute to thank you for your efforts on our behalf! You treated us and our home as if we were your family and the results were outstanding!! The chairs and side table were a wonderful and very unexpected addition to a process that was both thoughtful and considerate. I hope our paths will cross again. If there is anything I can do for you please pick up the phone." "Jason Sands assisted my wife & I sell our existing home and find our new dream home that suited our growing family. We were impressed with the professionalism, dedication, and attention to detail he showed throughout the entire process. In a potentially stressful time Jason provided us peace of mind! We will undoubtedly use him for all future moves!" "We bought and sold with Jason 10 years ago moving from the West to the East end. We then moved out to Loughborough Lake, spur of the moment, without him. We used Jason again when we decided to sell." "Jason, we can’t thank you enough for your help with Creekford! Your knowledge of every little detail whether it was the wells or septic was overwhelmingly impressive! We were looking for an incredibly unique property – in city limits, tons of acreage. We found one which fell through however, Jason went above and beyond and soon secured us our new home!" "We used Jason Sands as our Realtor to purchase our home back in 2012. With a growing family 4 years later we decided to move again to a bigger home yet keep our existing neighbourhood. It wasn’t an easy task but Jason took a dynamic approach and hand wrote letters to potential homes in the area to stir up some action. Within a month we successfully purchased one of these homes and sold ours! Jason’s flexibility and determination paired with the constant availability of him or his assistant was fantastic! Thanks Jason!" We're not the best because we sell more properties. We're the best because we're more than just agents. There's a reason why you see more REMAX signs on more lawns all across the world. That's the sign of a great agent. 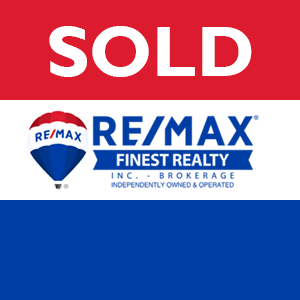 That's the sign of a REMAX agent.